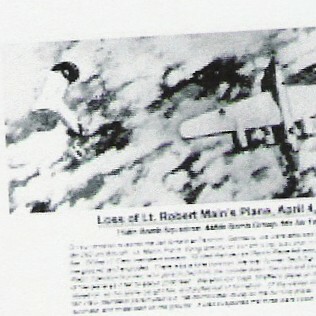 Lt. Robert Mains was a pilot of a replacement crew that joined the 448th 714th Sq in Sep 44. Here is some info I recceived on my father-in-laws last flight. It is tough to read but if you take time to read the article ED CHU was a tailgunner in the 448th and saw Charlies plane go downand thought for sure no-one survived. But fortunately for Chuck he was able to jump out of the bomb bay doors and get his chute to open about 2000ft above ground close but a safe landing even though he was captured by enemy forces. The surviving member was Charles E Cupp Jr. The above was sent to me by RIKISIN who's email address is no longer Valid. If she reads this or anyone happens to recognize her please inform me.